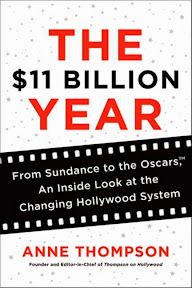 As an entertainment journalist who’s seen her own field drastically change over the last 25 years, Anne Thompson is uniquely qualified to evaluate the way that the Hollywood system has likewise evolved with advances in technology, fleeting trends and the passing of time. One of the smartest and most refreshing voices working in a career that has been historically dominated by men (until the great democratic equalizer of the internet took off and everyone began to have their say as new distinct points-of-view came out of the cyber woodwork), Thompson has bravely ventured into every medium. In high profile roles as a staff writer, columnist and editor of some of the most prestigious publications in the industry, Thompson has spilled both newspaper and magazine ink alike. From working as a columnist handling the business side of film for LA Weekly to transitioning to her new home at Indiewire online where her blog Thompson on Hollywood has become a must read for colleagues, movers, shakers as well as film buffs in the know over the past several years, Thompson recently called upon her vast experience to pen her long overdue first book, The $11 Billion Year. Painting a fresh and fascinating yet analytically informative picture of a studio system stuck in an existential, midlife crisis, Thompson lists and fleshes out all of the challenges facing the executives over the course of the box office record-breaking year of 2012 in one chronological journalistic snapshot after another. Basing the structure of her work (which takes us from Sundance in January all the way up through the Oscars awarded one year later) on William Goldman’s Broadway themed nonfiction classic The Season that took a similar production-by-production approach, Thompson launches into her accessible, highly readable yet eye-opening behind-the-scenes book. Taking us along with her to festivals and press junkets, roundtable interviews and conventions in her demanding professional schedule where Wi-Fi access and good walking shoes are a must, Thompson keeps a detailed journalistic log of the goings-on while chronicling not only the films and players that will garner both awards consideration and buzz later on in the year but also the films that failed to find an audience. Indiewire readers in particular will enjoy the portions of the book wherein Thompson champions little movies and fills us in on not only how the works came to fruition but also theorizes why they may have gotten lost in the shuffle of festivals and distributors in place of breakout hits like Silver Linings Playbook and Argo. Likewise, it’s riveting to see her chart the wreckage of blockbusters that came crashing down in a catastrophic house of cards as one multi-hundred-million dollar tentpole franchise bombed after another while fulfilling the prophecy made by Spielberg and Lucas, with which she opened the work and set the stage for the business of film at a “make it or break it” verge of something great. In fact it’s this beautifully written introduction that offers Thompson a unique opportunity to step outside her role as reporter. 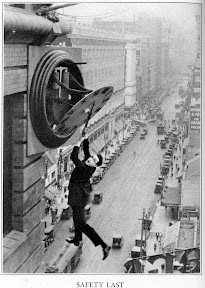 Waxing both poetically and analytically on the industry she covers, she uses a brilliant image to describe the way that the studio system tries desperately to hold on to the methods and modus operandi of the past while time marches on by likening it to Harold Lloyd clinging to the clock in Safety Last. Offering intriguing commentary on the colorful cast of characters behind and in front of the scenes that will leave their mark on the banner year, while she obviously doesn’t even attempt to cover the 670 plus films released in 2012 (wherein a much smaller number finds distribution), she uses a keen critical eye to help explain the complex and fractured state of the business. With more and more audiences drawn to Netflix original series versus spending big bucks for a ho-hum product at the multiplex, she evaluates the pros and cons of video on demand releasing in offering people with physical limitations, schedule conflicts or childcare problems the chance to see first-run films to stay part of the pop culture conversation. At the same time, Thompson also addresses the allure of TV in seducing Steven Soderbergh to retire from traditional feature filmmaking. 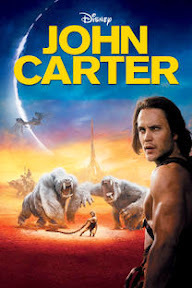 From the role that marketing can play as well as how too much second guessing your film in an attempt to reach every demographic can lead to disaster (John Carter), she discusses the differences another edit or a new title can make while also offering some good advice for filmmakers wrapped into her otherwise informative text. For example, she advises people to start the titles of their films with the letter “A” (like Arbitrage) since it’s faster to find on a VOD menu and statistically brings in more revenue to stressing the importance of the G through PG-13 rating and its role in global ticket sales. Yet just when you think she’s only focused on the business side of the story, Thompson goes from fangirl (recalling a childhood reading comics) to Oscar handicapper, explaining that recent rule changes have made certain races harder to call than ever before. Admittedly, some of the information does get a little repetitive the further we get into Year but logically, this probably owes more to the chronological structure of the narrative than anything else as by that point, we’re dealing with topics that circle back to information referenced earlier on. Needless to say, with this in mind, it’s an extremely minor flaw as – thanks to an index – after a first read-through you’ll most likely be jumping back into her text at various points in the narrative and will be grateful for the approach in getting your bearings faster. Following Good Reporting 101, Thompson covers the who, what, when, where, why and how before forming her own thesis based on the facts to share not only what went down but ideas on how to change things for the better. Still a film lover at heart and one still in the field for the right reasons – ready to advocate for the films and storytellers that inspire her – although some of the data regarding Hollywood’s love affair with reboots and remakes can be depressing to art-house, foreign and indie lovers who want an original story with which we can connect, Thompson takes a cautiously optimistic approach. Sharing her wise advice and voice of experience, we’re left hoping that just like she’s done in an amazing career that’s taken her from one enviable post to another, Hollywood will see this new era of digital film, VOD and a whole new world of original voices for the positive developments they are to branch out. And maybe with her $11 Billion title to guide them, studios will let go of that clock from the past and take a leap of faith – using these new opportunities to find new ways to bring the world together, across cultures and generations for shared experiences on the silver screen (whether in home or at the multiplex). Note: Please click here to read our other Book Reviews. Film Intuition is in the process of moving all other arts reviews (originally published in Jen's P.O.V.) to our Review Database.